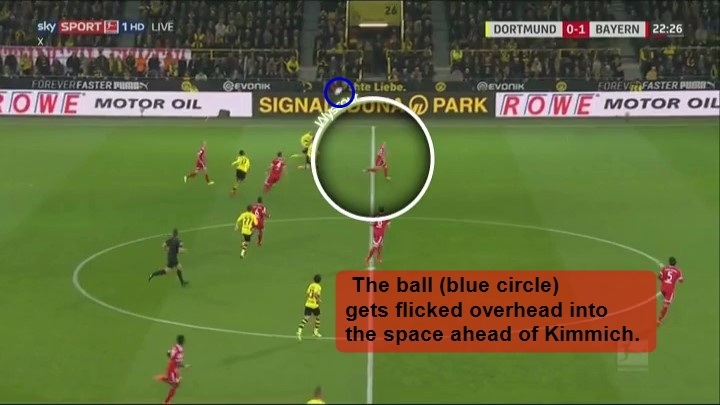 Analyzing Joshua Kimmich's defensive positioning and off-the-ball movements. It was always going to be impossible to replace Philipp Lahm at Bayern Munich, but with 22-year-old right-back, Joshua Kimmich, Die Bayern can rest assured they have a two-way, complete option down the right wing for years to come. Of course, as with any young star, the rumors run rampant (especially during international breaks,*eye roll*), but there’s plenty of reasons for Bayern supporters to hope for a long tenure from Kimmich at the Bavarian club as he is seen as Lahm’s heir. With that said, Kimmich came into the wider public consciousness during the 2015-16 season when then manager, Pep Guardiola, bragged about the youngster’s complete attributes. At that time, he was used sporadically as a center-back. Furthermore, in Carlo Ancelotti’s first season at Bayern, Kimmich was used in more of a central midfield role at times, and while he was solid in that area of the pitch as well, Ancelotti’s favoritism of more tactically experienced players proved stronger. But that all changed with the appointment of Jupp Heynckes after Ancelotti was sacked following Bayern’s Champions League defeat to Paris Saint-Germain this season. Now under the guidance of the 72-year-old tactician, Kimmich has been restored to his favored right-back position, the role he also uses with the German national team. It is in this position that we’ll be analyzing the 22-year-old. Without making this an in-depth report of Bayern’s current system under Heynckes, we musty briefly analyze how Kimmich fits into Bayern’s tactical plans and game methodology and what their system currently consists of. Under Heynckes, Bayern plays a 4-3-3 based on positional-play/possession in attack and defend (when they don’t high or counter-press) in a man-orientated 4-2-3-1 defensive block. In build-up phases, Kimmich is required to get out wide on his right wing or half-space (usually) and help support his midfield & winger. 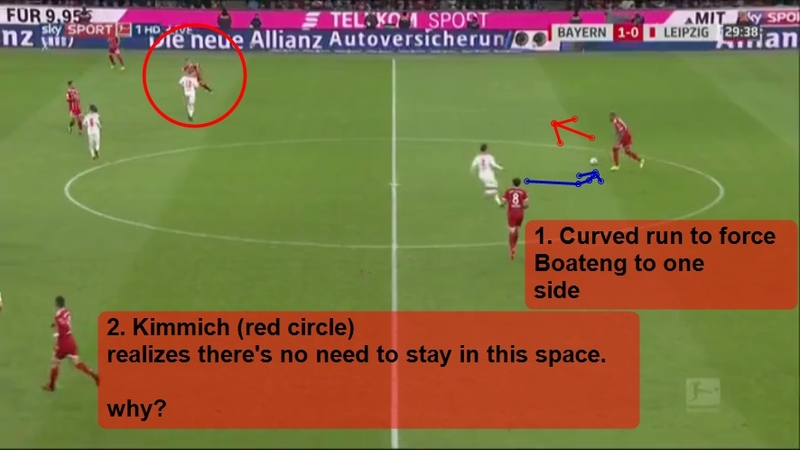 In defense, Bayern’s ball-side and man-orientated 4-2-3-1 block requires Kimmich to aggressively, along with the ball-side midfielders and winger, close down space on the opponent. Furthermore, Bayern usually deploy a man-orientated 4-3-3, or as seen below, a 4-1-4-1 high-press. Kimmich, unless his opposition forward marker drops deep, will not get involved in the press above or enter the attacking half. High-pressing aside, Kimmich, just as left-back David Alaba, is deployed to go as far wide as possible when Bayern are in their build-up phase and are near the midway line. But what about Kimmich’s role in penetrating the opposition’s midfield and when Bayern overload, in attack, around the lower-third? Well, Kimmich is instructed, when his side opts to build-up down his right side, to support, form triangles, and link-up with his midfield and or Arjen Robben. 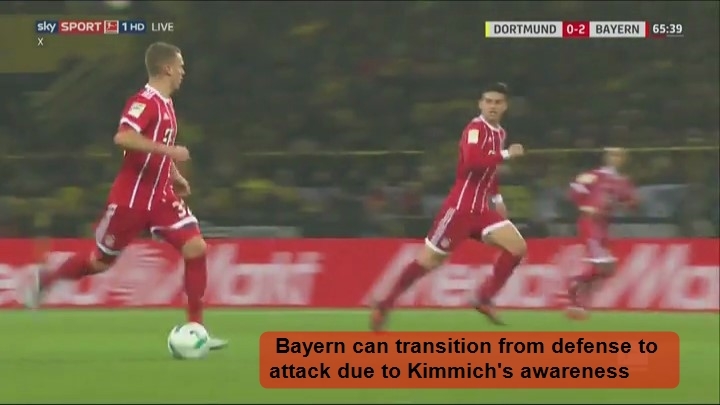 As for the attacking lower-third – when Bayern decide to overload an opponent down their left side, Kimmich frequently makes late-runs down his right wing to overlap the overload. He does this to help give his side positional superiority for clear low-crosses into the box. As you can see above, Borussia Dortmund reacts to Bayern’s overload with a seven-man overload of their own. Dortmund have a 7 v 5 in their favor. 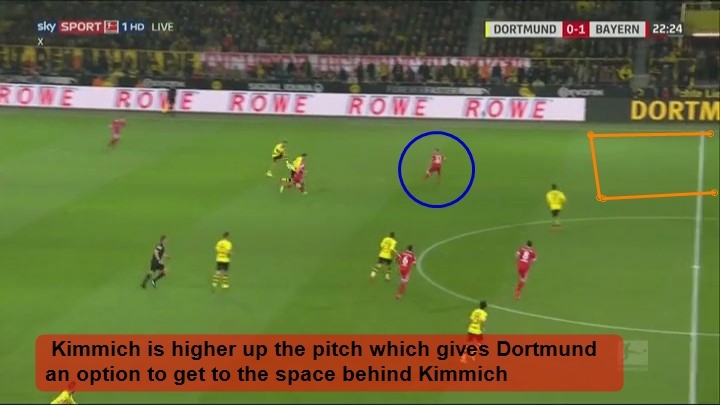 So, if Kimmich gets the ball down his right wing for a clear cross, that means less Dortmund players in the box, which means a higher chance of success to accurately hit your crossing target. However, the patterns, phases of play, and positional roles above are just the basics of this player profile. Let’s get into some of the more individualistic skills and attributes of Kimmich’s game. Both areas, of course, are just a sample size and will be broken down thoroughly, regardless. I picked the two areas that show his biggest strengths in terms of recent matches and form, for the most part. We all know of his ability to make key line breaking passes and accurate low-crosses, so I won’t bore you with numbers. But, below is a spider graph produced by fellow ESDF analyst, Tobias Hahn, if you’re interested. Instead, we’ll focus on things that are harder to gauge and appreciate with numbers but are extremely important to the modern full-back – a position that requires the need to know how to read the play and opponent to cover both attacking and defensive duties. When it comes to reading the match, from any position, off-the-ball movements are ways to improve your role as a player in a number of situations. Whether your team is in possession of the ball, defending, or trying to win it back, what you do away from the ball can be the difference between conceding a goal and scoring a goal. Kimmich, on both sides, has a great understanding of anticipation in defense and how to achieve positional superiority in attack. 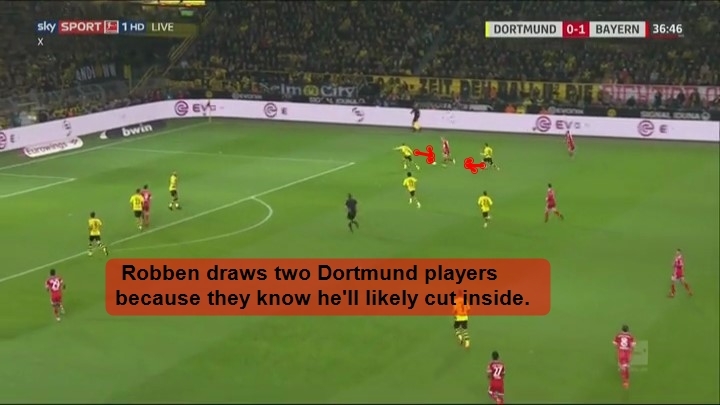 Off-the-ball movements: achieving positional superiority when the opposition tries to trap a center-back. In the phase of play below, Kimmich demonstrates his ability to read what the opponent is doing in defense, how to help his side beat it, and build up the play in the process. 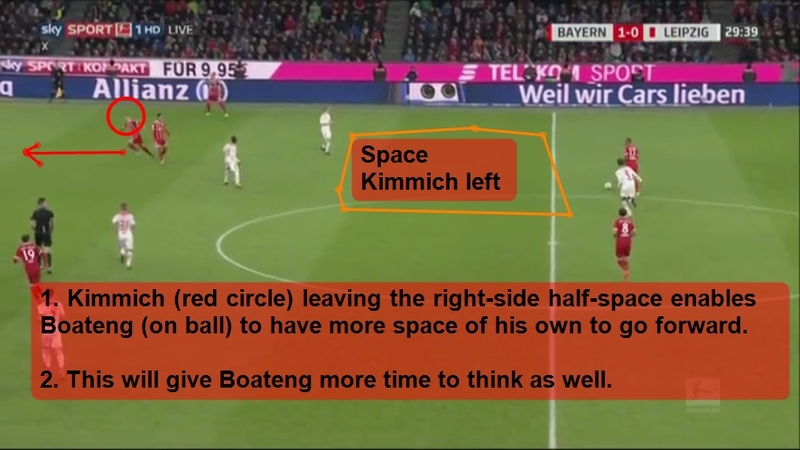 Above, we see how Kimmich reads how RB Leipzig’s striker forces Jerome Boateng to the right-sided half-space and realizes he doesn’t need to be in the right-back position anymore. Instead, he sprints up vertically so Boateng can have more time and space on the right. Finally, when Kimmich stops, we see he forms a triangle with another midfielder and Robben. 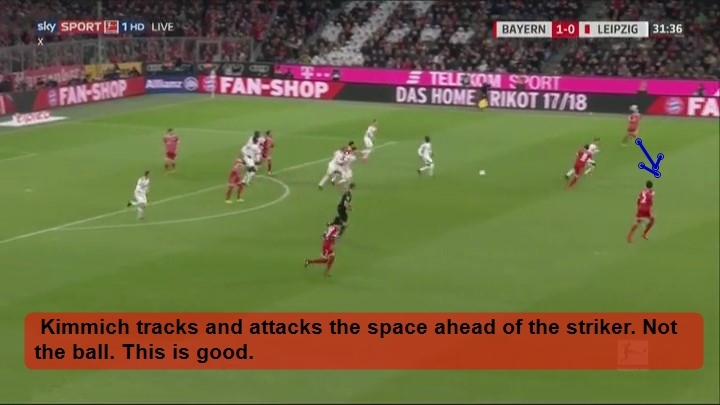 It is this type of awareness to identify what the opponent is doing defensively, knowing you need to leave your space to give a fellow teammate more time, and understanding that you need to occupy another space to give your side positional superiority that sets Kimmich apart. It is this type of reading off-the-ball in attack that makes him such a smart and heavily sought after right-back. The sequence of screenshots below illustrates Kimmich’s athleticism in 1v1 defending and his ability to anticipate the transition from defense to attack with fine timing and positional awareness. When the Borussia Dortmund player enters Bayern’s penalty area, Kimmich’s duty is to stop him from scoring, obviously, and he does this with a sprawled-out split of sorts. The striker faked a shot to the left and at the last minute shot to the right. Kimmch reacted in a split second and stretched out his left foot to block the shot. Kimmich then realizes Robben has won the loose ball and has started to advance toward the right half-space. As a result, he realizes he needs to occupy the open space in the central axis and sprints forward. Robben knows he will be there. It is becoming clear Robben and Kimmich have a great understanding. It is no secret that Robben loves to cut inside coming down the right wing, but there’s a clear understanding between Kimmich and the Dutch international that is brewing. In the particular attacking play below, we see that Kimmich overlaps Robben’s run at the right time when the veteran winger attracts two markers thus freeing up Kimmich down the right wing to find his target in Robert Lewandowski. Kimmich’s accuracy for low-crosses has improved immensely, and his ability to play off of Robben’s biggest dribbling strength is huge for Bayern. In the next sequence, we’ll see an area of play that defenders who want to succeed at actually defending need to learn – when to press and when to simply track back in anticipation of a line breaking pass or, in this case, an overhead flick. 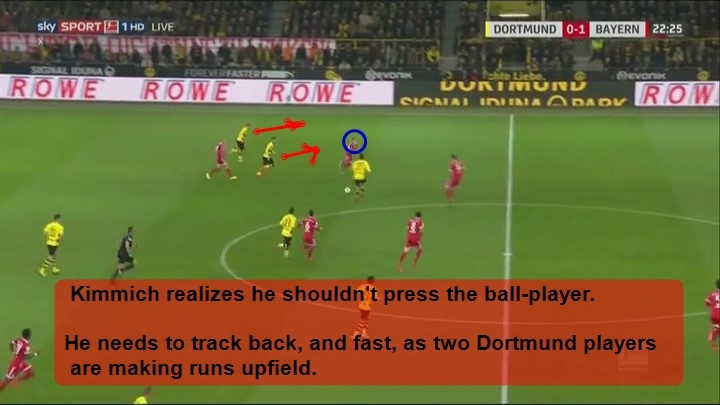 Below, you’ll see the moment Bayern lose the ball in the attacking half and Dortmund transition from defense to attack. 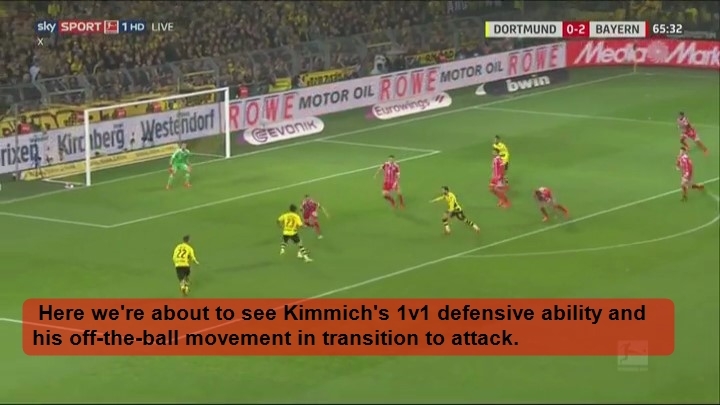 When Dortmund get the ball, Kimmich is an advanced position on his right wing. Have a look at how he anticipates his need to track back and NOT press the ball player. While a lot of professional right-backs may recognize the need, given they’re advanced position and with two opposition runners looking to get behind the defense, to track back, some realize this when it is too late while others may be brave and try to simply win the ball as soon as the nearest opposition midfielder receives the ball. Kimmich, in this case, does a phenomenal job at instantly realizing the risk of his current advanced position and opting to track back quickly to take away the threat of an overhead flick getting behind the back line. Although Kimmich’s overall 1v1 ability is solid, in the next sequence we’ll see how he failed to accurately contain Christian Pulisic. Pulisic, as many readers may know, is very skillful at beating his markers and evading pressure. Kimmich, below, when faced with the opportunity to jump on Pulisic near the touchline down the right, curves his pressured run/challenge to the outside instead of cutting inside to at least force Pulisic closer to the touchline. Pulisic, as a result, easily burns him and cuts inside further into Bayern’s right-side half-space. Many coaches would prefer an opposition threat dribbling down the wing rather than the half-space. Kimmich will likely execute and improve on these 1v1s against tough dribblers in time. Defensive positioning: Anticipating a turnover, quickly closing down time and space, and stopping opposition counter-attack. When your side loses the ball near the attacking third, it becomes key, especially on a possession-based team, that your midfielders and full-backs know how to transition from attack to defense. However, it can be even more helpful when a full-back anticipates the turnover before it actually happens. Below, we see how Kimmich already jogs closer to the central axis as he realizes RB Leipzig have a high chance at winning the ball and initiating a counter-attack. He then stops the counter-attack as he chases down the most advanced Leipzig forward on the break. Once Kimmich, who is all the way on the right wing, realizes the midfield will not pass to him and will try another way to penetrate RB Leipzig’s penalty area, he jogs closer to the central axis in anticipation before an actual turnover happens. That is what you call excellent football IQ. Once RB Leipzig gets the ball, he’s already closer to the most advanced opposition striker and can use his pace to track the run and pick off the ball. The jog closer to the half-space, before the turnover happened, is the key. Kimmich, after analyzing his off-the-ball movements and defensive positioning, is a player that is setting the standard high for the modern full-back – a position that I think has become just as important as midfielders. Kimmich can read the game and has the license to find the spaces necessary in attack, but he also knows when it is best to think of defense first and anticipate potential threats to Bayern’s CBs and back line. I wouldn’t be surprised if he became the world’s best right-back in a few seasons.